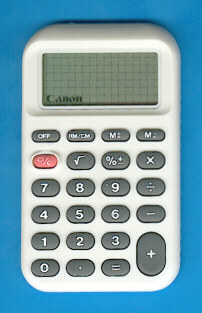 Size: 3.6" x 2.1" x 0.35"
This Canon LC-25H is a very basic calculator introduced in 1990. It was manufactured by Nam Tai Electronics, Inc. in China and basically it resembles the TI-1105 introduced in the same time frame. Disassembling the LC-25H reveals indeed a well known design using a single-chip calculator circuit wire-bonded direct on the printed circuit board (PCB). Don't miss the LC-23, LC-28H III and the LC-210L. © Joerg Woerner, October 1, 2004. No reprints without written permission.